James Tocco has a worldwide career as a soloist with orchestra, recitalist, chamber music performer and pedagogue. His repertoire of over fifty works with orchestra includes virtually the entire standard piano concerto repertoire, as well as more rarely performed works such as the Symphonie Concertante of Szymanowski, the Kammerkonzert of Alban Berg and The Age of Anxiety of Leonard Bernstein. 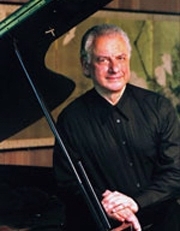 Hailed in solo recitals for his interpretations of Beethoven, Chopin and Liszt, as well as composers of the 20th century, he is one of the few pianists in the world to regularly program the keyboard works of Handel. In 1973, Tocco won the International ARD Competition in Munich and appeared in 1975 at the Vienna Festival. Since then he has toured the globe with performances in the U.S., Canada, most of the countries of Europe and South America, the Soviet Union, Japan, Australia, South Africa and the Middle East. Solo appearances with the major orchestras of the world have been given in Berlin, Munich, London, Chicago and Los Angeles, as well as festival participation in Salzburg, Vienna, Lockenhaus, Holland, Schleswig-Holstein, Wolf Trap, Ravinia, Mostly Mozart, Santa Fe and the Hollywood Bowl. His Pro Arte releases include the world premiere recording of Bernstein's complete solo piano music and the first recorded performance of the piano solo version of the Suite from Copland's Rodeo. He recorded the complete four piano sonatas of Edward MacDowell for Gasparo. ECM Records released his live performance of Erwin Schulhof's Cinq Etudes de Jazz and Deutsche Harmonia Mundi released his recording of the complete Bach-Liszt organ transcriptions as well as a second disc of Bach-inspired piano compositions by Franck, Liszt and Busoni.